Heather was itchy and unhappy the first day she wore her Santa hat to work, so I picked up stitches off the back of the cast off edge with Bernat Handicrafter cotton and did a k1 p1 rib on the inside of the brim which I reconnected and simultaneously cast off at the top of the white. This was easy because the purl bumps at the transition of the colours were easy to follow. It did the trick for her. I guess for anyone who is not sensitive to wool, or has bangs, or wears their hats pushed back above the hairline, it is not an issue, but it was pretty simple to retrofit the hat in this way for anyone who is sensitive. It worked ok to use the handicrafter stitch for stitch because it is close enough in weight to the Cascade 220. Its not a precision deal. 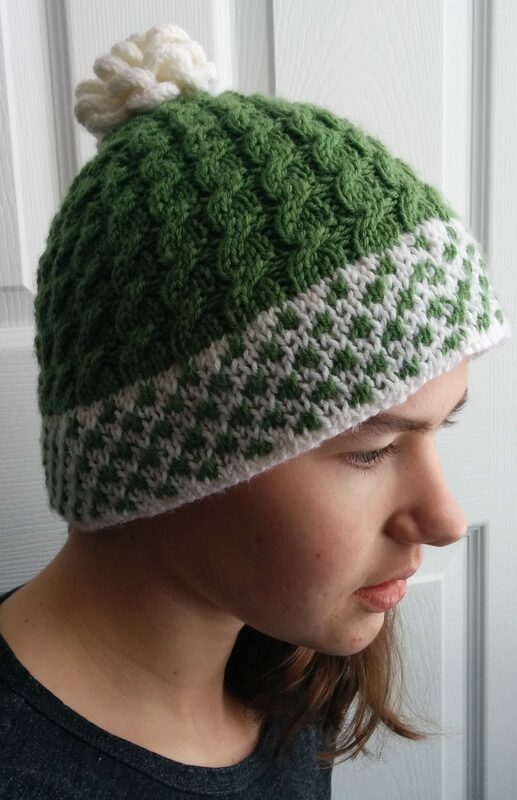 I was doing this green and white hat for her to wear at work after Christmas, so I picked up from the back of the cast on edge with cotton and built in the cotton ribbing as I changed to green at the top of the brim. I knit my first row of green through the brim and the corresponding cotton stitches together. This hat uses Swiss Check, pg 90 which FINISHES THE COLOR-CHANGE PATTERNS CHAPTER…YEAH!!!! and Travelling Cable, pg 280. You would have to know the travel is there to see it. It moves over one stitch per repeat. It may be more obvious on a longer item like a scarf or something. I topped it off with one of my i-cord roses. Follow the link for detailed instructions. Mum needed a headband, so I made one for her with a cotton lining too. I did it the same as the brim of Heather’s hat but I ended the hat early. 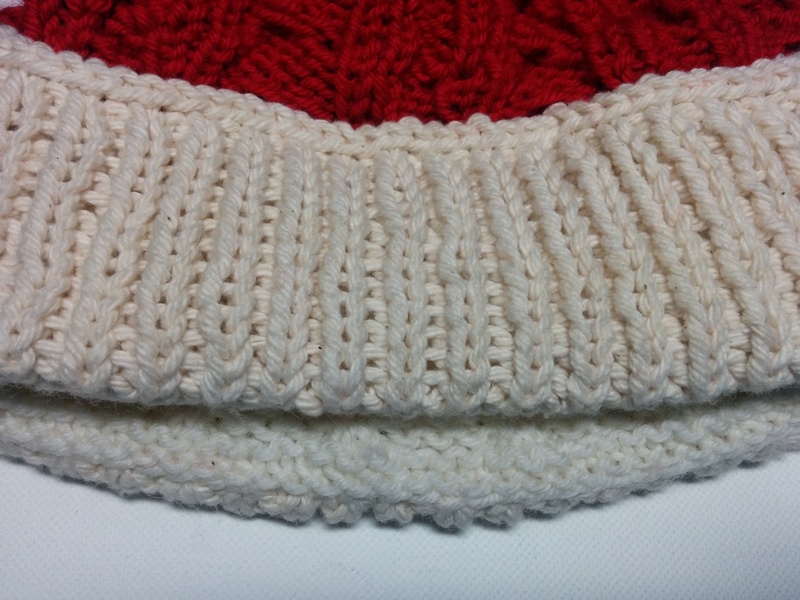 It uses Round Cable, pg 247 and Triple Gull-Stitch Cable, pg 248. This entry was posted in Barbara Walker, knitting techniques and tagged A Treasury of Knitting Patterns, Barbara Walker, Bernat Handicrafter, Cascade 220, hat, knitted hat, knitting, Knitting and Crochet on January 1, 2017 by gillianknitter. If you are taking requisitions… can I please have a cotton lined headband in either cream, white or black and white checkerboard? I will pay materials/artesian wages & shipping and handling as long as Jacob does not handle it ?? The headband circumference of my head is 22 inches.